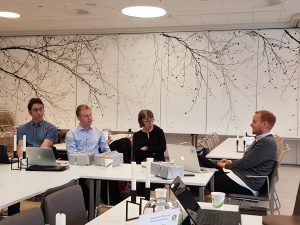 Four of the experts in the scientific advisory council came to Bergen over two days, the 7th and 8th of February, to council the project and our PhD candidates and Post Doc employees. Viktor Kaldo, Per Carlbring, Tobias Sonne and Wendy MacCaull gave us feedback and shared their knowledge and expertise with us. We are already looking forward to next year’s Scientific advisory council meeting.